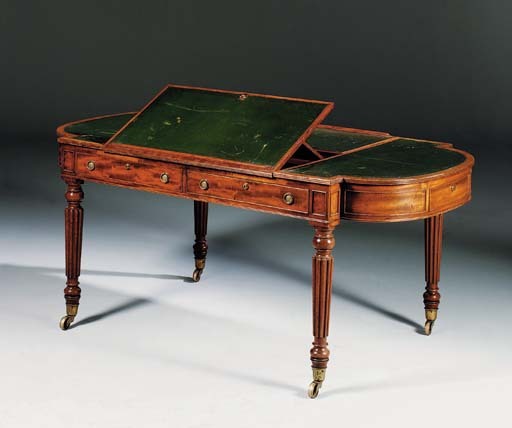 The richly-figured bead-framed veneer of this writing-desk relates to a similarly-shaped example supplied to the 1st Lord Brownlow (d. 1807) for Belton House or Carlton House Terrace and sold by Lord Brownlow, Belton House, Lincolnshire, 30 April-2 May 1984, lot 88. The latter example has a similar frieze configuration but is raised on trestle end supports. The recent discovery of Thomas Willson's trade label tells us that Thomas and his wife, Mary Willson established a furniture broking firm in 1818 at 68 Great Queen Street, London. Furthermore, it appears that Thomas Willson was both cabinet-maker and dealer. The firm's stamped furniture consists of second-hand pieces which were simply retailed, and items made in their own workshop (C. Gilbert, Pictorial Dictionary of Marked London Furniture, 1700-1840, Leeds, 1996, p. 56, figs. 989-1006). Between 1830-37, after the death of Thomas Willson, the business was continued by Mary Willson and Son; after 1838 the business carried on under Matthew Willson.